Jazzland is Tim Warfield's ninth Criss Cross album, and his third encounter on the label --- following 2007's One For Shirley (Criss 1304) and 2010's Sentimental Journey (Criss 1324) --- on which he frames his singular tenor and soprano saxophone sound with the magisterially funky and swinging rhythm section of Hammond B3 master Pat Bianchi, Philadelphian drum titan Byron "Wookie" Landham, augmented --- as on Sentimental Journey --- by Bronx-born percussion wizard Daniel Sadownick. 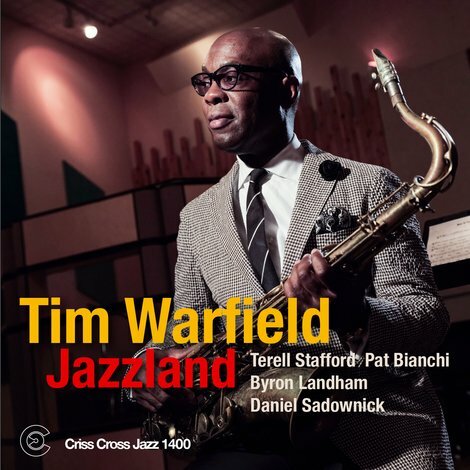 Trumpet titan Terell Stafford, a frequent Warfield partner, shares the front line. Over the course of 69 minutes, this group of mid-career modern masters offers a state-of-the-art view of inspired 21st century groove-focused improvisation.